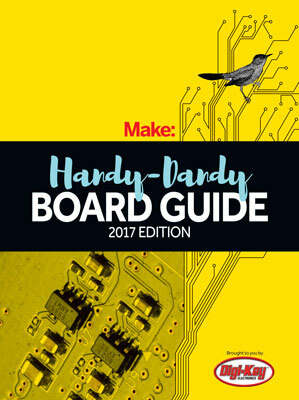 Ever wonder why you need to wire a breadboard to your Arduino, rather than having it built right in? The STEMtera Breadboard does just that, eliminating the mess of wires seen with most projects. It’s 100% Arduino Uno compatible, including the use of shields, and has two microcontrollers inside, an ATmega328P and an ATmega32U2 (of which the pins are exposed on the breadboard for quick prototyping). The unit is wider, longer, and twice as tall as a half breadboard, so you cannot attach other breadboards to it, but this is a minor inconvenience. Plugging in via USB, it is fun, fast, and easy for quick development or learning.